An excerpt from President Rodrigo Duterte's phone call to Vice President Leni Robredo: "Alam mo, Ma'am, kasi tinawagan kita para mahinto itong tanung-tanong… Kaya nga, e. Do not be apologetic. But gusto ko na itong tanung-tanong. Puwede ka Housing, Ma'am? Can you be Housing secretary? Tanggapin mo, Ma'am?" President Duterte’s phone call occurred right in the middle of an interview with a news reporter and his Cabinet members in Malacanang. His intention was to finally put a stop to speculations whether VP Robredo will spend her six-year tenure with a Cabinet position or not. The video footage of President Duterte’s phone call was published on the Facebook account of Presidential Broadcast Staff – RTVM, few hours after VP Robredo confirmed her appointment as HUDCC chief today, July 7. Here, PEP.ph (Philippine Entertainment Portal) rounds up some interesting bits from President Duterte’s impromptu phone call to VP Robredo. 1. Duterte unexpectedly asked a reporter to call up Leni. “Now, are you [reporter Rocky Ignacio] a friend of Leni? Do you have a way of communicating with Leni Robredo, the vice president? Can you call her now? “Bong [Go, president’s executive assistant], do you have the number of Leni? Call her. 2. Duterte asked Leni for permission to answer media’s queries. “Ma'am Leni—it is afternoon pa pala—good afternoon. Nandito ako sa opisina ngayon. “Tinatanong ako ni Rocky Ignacio sa Malacanang press kung bibigay ko raw kayo ng puwesto sa gabinete. 3. 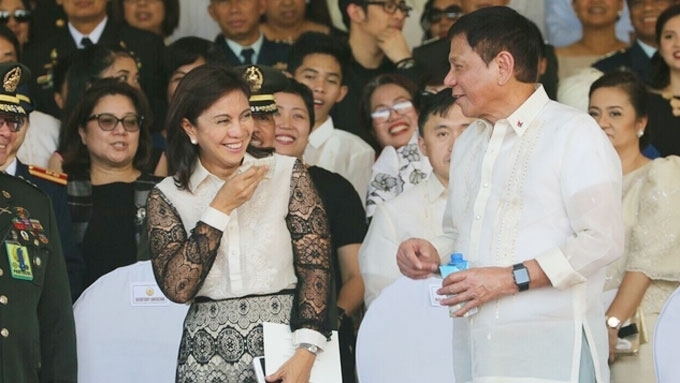 Duterte addressed Robredo as “Ma'am Leni” nine times. 4. Duterte respectfully asks Leni to be the HUDCC chief. “Alam mo, Ma'am, kasi tinawagan kita para mahinto itong tanung-tanong… Kaya nga, e.
“Do not be apologetic. Basta gusto ko na itong tanung-tanong [matapos na]. “Puwede ka Housing, Ma'am? Can you be Housing secretary? Tanggapin mo, Ma'am? “Huwag na, Ma'am. The executive secretary will hand you the appointment. 5. Duterte warmly invited Leni to the next Cabinet meeting.